The Journal of Web Semantics addresses various prominent application areas including: e-business, e-community, knowledge management, e-learning, digital libraries and e-sciences. 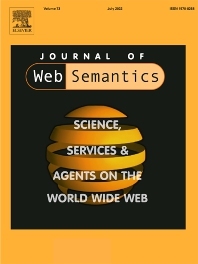 The Journal of Web Semantics features a multi-purpose web site, which can be found at: http://www.semanticwebjournal.org/. Readers are also encouraged to visit the Journal of Web Semantics blog, at http://journalofwebsemantics.blogspot.com/ for more information and related links. Each of these areas is covered by an area editor who supports the editors-in-chief. Furthermore, area editors manage the review process for submitted papers in the respective areas. • Research papers: Research papers are judged by originality, technical depth and correctness, as well as interest to our target readership. Research papers are recommended to have 15 - 25 pages in double column format. • Survey papers: We rarely accept survey papers, and beyond a sheer enumeration of relevant methods and systems, we expect a substantial technical insight to be gained by a survey paper. Survey papers are recommended to have 15 - 25 pages in double column format. Shorter or longer papers are allowable, if the objectives of a paper warrant deviating length. Descriptions that are either unnecessarily short or long will negatively impact chances of acceptance.